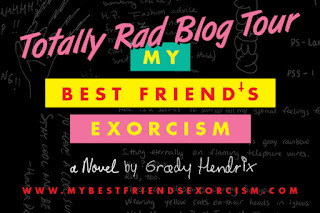 I am so excited to have Grady Hendrix on the blog today. I am not generally a fan of the horror genre, but when I saw how clever and subversive his novel Horrorstör was (the cover looks conspicuously like an IKEA catalog), I knew I had to read it. 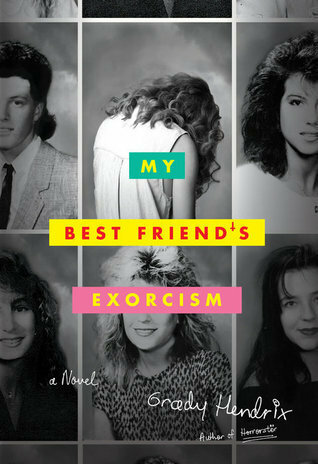 He now has a new novel out this week called My Best Friend's Exorcism that takes some of that same cleverness and subversion that he's known for in his IKEA catalog, I mean Horrorstör, and laid out his new book like a high school year book full of 1980s nostalgia. As far as food was concerned, the Eighties was the best of times and it was the worst of times. There was the disastrous introduction of New Coke, one of the biggest flavor fumbles in soft drink history. McDonald’s introduced a McPizza that couldn’t fit through its own drive-thru windows and Burger King introduced tiny burgers that fell through its grills. On the other hand, what’s so bad about the decade that gave the world microwave popcorn, Cool Ranch Doritos, and Snapple? People had a lot of feelings about food back in the Eighties. Real Men Don’t Eat Quiche was a 1982 book satirizing sensitive men that spent 53 weeks on top of the bestseller list, but all it did was make everyone want to eat quiche, which suddenly appeared overnight on every single restaurant menu. Associated with the despised yuppies, it joined pasta salad, sundried tomatoes, pesto, and pretty much anything else that tasted good and didn’t come out of a can as foods considered un-American. Tofu became shorthand for health-obsessed, flavor-hating yuppies, for some reason, even though no one in America was actually eating it. Commercials pushed food catchphrases into the national vocabulary as Paul Masson swore he would sell no wine before its time, everyone put on posh European accents to ask, “Pardon me, would you have any Grey Poupon?”, and Dunkin’ Doughnuts reminded us every morning that it was “Time to make the doughnuts.” Food got political, too. Fried eggs famously came to represent your brain on drugs as part of Nancy Reagan’s “Just Say No” campaign, while the Wendy’s commercial tagline, “Where the beef?” helped Walter Mondale earn the Democratic nomination for president in 1984 when he used the tagline to trash his rival’s policies. Food created celebrities, like the Bartles and Jaymes brothers and the California Raisins who saw their cover of “Heard it Through the Grapevine” land on the Billboard Top 100. Then there were the actual celebrities who became even more famous through food, as Paul Newman rolled out the very first bottles of his Newman’s Own salad dressing, and Jell-O Pudding Pops made Bill Cosby their spokesman. Whoops. Foreign foods were suddenly everywhere as people realized that gyros from Greece were not made of fried dogs and were actually delicious. Sushi was a punchline to the point where in John Hughes’s The Breakfast Club it told you pretty much all you needed to know about Molly Ringwald’s vapid princess that she brought it to school for lunch. But it was the perfect finger food for Hollywood celebrities who wanted to eat but never get fat, and by the late Eighties sushi was a national fad. Everyone was experimenting with new things, either eating tiramisu or trying to make Cajun blackened fish or giving each other enormous tins of flavored popcorn for Christmas. Even McDonald’s was expanding its horizons, introducing Chicken McNuggets and the McRib, which tasted like a car floormat made of gristle and coated in delicious barbecue sauce. All this eating led to a lot of dieting, and Carnation breakfast bars became the meal of choice for anorexic teenagers across the country if they weren’t already experimenting with the all-liquid, milkshake-based Cambridge Diet. If you were posh, you could try the Scarsdale Diet, the Rotation Diet, or the Beverly Hills Diet. A freezer stocked with Lean Cuisine frozen dinners became a sign of affluence and body consciousness. Even poor people had diet choices, like Richard Simmons’s gauche Deal-a-Meal, the F-Plan Diet, or the “As Seen on TV” miracle of Grapefruit 45, which promised that nature’s best kept secret was now available in pill form. No rich person was going to touch a diet that reached its customers through infomercials on TV. Besides, the 80s brought the truly wealthy the best weight loss supplement ever invented: cocaine. 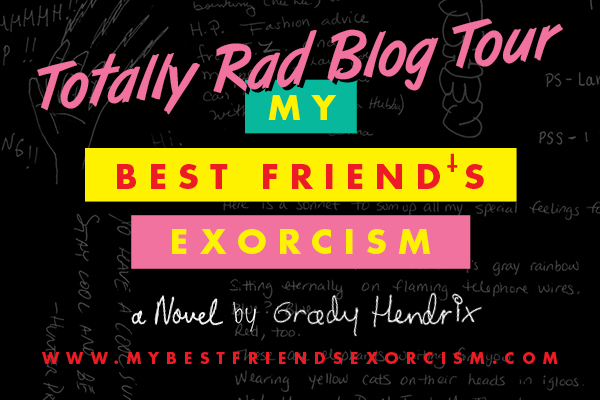 Grady Hendrix’s previous novel, Horrorstör, was hailed by NPR as one of the best books of 2014. He lives in New York City. Check out yesterday's blog tour post on the blog A Dream Within A Dream.